Right upfront, this post is a bit longer than most (my rants turned into stories usually turn out that way.) However I think this is important, and I hope you will take the time to read this, and choose it as one of those posts you copy and share with your staff in your next huddle: This concerns them too. Get their help. Today’s post presents a problem, and my follow-up post Thursday will present what I feel to be a big part of the solution we can collaborate on. We interrupt our normal programming of Tuesdays’ leadership topics to talk about Ho‘okipa: Aloha inspired customer service. But then again, everything is about leadership —or the tragic absence of it. 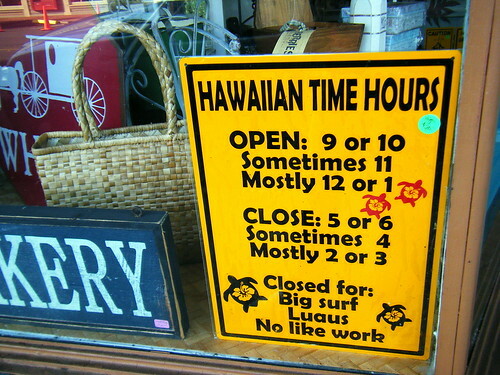 I recently set a goal to write about exceptional customer service in our Hawai‘i nei, for we are the land of Aloha, right? I love spreading the good word about how our values play out every day the way they do. So I went in search of a new story I could share with you and also build a presentation around (my Ho‘okipa class schedule resumes in September), one which would inspire and motivate us anew as we Ho‘ohana together. Unfortunately I failed. In fact, I ended up with a rant I had to sleep on and tone down. I hate when my writing slips into any negativity at all, however I also seek to write about what’s current and about the way things are; I have learned that it’s best to tell the truth, even when it is less than pleasant. So I need your help in creating a new truth I can write about. Here’s the story the way it played out. Last week was one of assorted errand-running for me; it happened to be one of those times I could batch the things I had to get done into workdays which were scheduled close to home. So I lined up those appointments which fall into the category I’ve come to call, “the business of life” —servicing my car, going to the dentist, picking up a printer I’d taken in to repair; those sorts of things. I was sure I would have lots of opportunities to work on my Ho‘okipa writing goal. The businesses I happened to visit would all qualify as those who are more recession-proof than most; competitive pricing and discretionary patronage isn’t really part of the picture. Consider the dentist: Skipping your semi-annual appointment with the hygienist can really come back to haunt you. When you (the customer) seek out these basic-need, business of life companies, you just need them, period, and you’re counting on them performing well for you. Chances are you’ll need them again one day in the future, and so you have this vested interest in them; you truly are pulling for them, wanting them to succeed and do well, remaining in business for the long haul. You know they support you, and you are willing to support them. A good part of this wanting them to do well, is that you ARE going to pay for their products and services because you do need them; due to different variables, you feel that your choices are limited. So you want to pat yourself on the back for being an intelligent, rational and choosy consumer, making a smart choice even if reality bites and you don’t really have that much of a choice at all. Sometimes you’ll feel this way on O‘ahu, but when you live on a neighbor island “slim-pickings” can be quite the understatement, and you learn to live with scarcity and the so-called “price of paradise” at the extreme ends of the scale. When I took my run yesterday morning they were changing the price at my neighborhood gas station to $3.27 for regular unleaded ”“ and the cars were patiently lined up, waiting their turn to obligingly swipe in their plastic charge cards for a full tank. Sadly, the businesses I visited over the last week were a bitter disappointment. They made me feel like a dummy customer and a victim of their complacency ”“ pure yuck. I didn’t have much choice with certain things ”“ for instance, where I live, my spare tire had to make a 45-mile drive for me to get a new one from the only place which had it in stock (which doesn’t necessarily mean the new tire would match my other ones; it doesn’t). I waited over an hour past the time they committed to having it done, two hours altogether for a 15-minute tire change, and then just as I gratefully approached my ‘finished’ car to leave, I noticed that the tire pressure was so off balance the car looked visibly crooked. The mechanic didn’t disagree when I pointed it out to him and asked him to recalibrate the tire pressure for all four tires; he did so. However I felt so deflated and disappointed; how dare they make me feel like a fool for choosing them? How dare they make me feel grateful to finally leave them and their stifling hot waiting room, where no one bothered to let me know the job would take longer? How could I be so foolishly accepting of a new tire which cost me $131.73 (yep, one tire) and so much aggravation, a price tag I paid without a second thought or complaint? How dare they make me now feel that it wasn’t a good choice to have been there at all, and I was the one who was wrong, dumb enough not to chance driving another twenty miles on my spare tire to give my business to someone else? Is there a pulse here? This is just one example of what I think of as the biggest sin committed in business today: complete mediocrity. By the time the week was over I’d collected a few more unfortunate stories which gave me a very severe case of Ho‘okipa withdrawal. I was craving some exceptional service somewhere, or even uneventful service, but from lively and engaged people! My expectations were getting so low, that surely the warmth of Aloha alone would trump product and service quality, wouldn’t it? I am sure that no one working at the businesses I visited wanted to do a bad job, or deliberately set out to get me (believe me, I know that being a nice customer works much better than being a complaining one). No one intentionally lied to me, and no one was rude to me. They did something worse: Either they ignored me or took me for granted. No one abused me or flagrantly ripped me off (I don’t think” please let my ignorance be bliss, and don’t tell me what you paid for the tire you last bought for what is one of the most common cars found on our roads today). It seemed that no one had enough energy to intentionally be awful; they just kinda slumped their way into a downslide, and then they stayed there. No one seemed to have a pulse. Everyone was just so blah and uninspired. So going through the motions unremarkable. In fact, they weren’t even passably good. They skipped steps and didn’t even notice that they did. Customers today expect more, even if you are the only game in town. If anything, we the customers who feel forced to patronize you for basic needs feel that you’ve been assured of our continuing business, and thus are able to do better ”“ you’re the one with a palpable revenue stream right now! We can clearly see your veins; an example is the monthly bill we get for your ‘utility,’ but your pulse with not taking us for granted is getting alarmingly weak and hard to find. I didn’t wait two hours for that new tire because they had too little business, but because they had too much business and couldn’t keep up. And it wasn’t an unexpected jump in business ”“ they’re always like that. The only customers who actually wait in their establishment are those like me who live the coastline drive away. When they got behind, they didn’t seem to care; when a customer sitting in your waiting room for hours doesn’t make you or your staff uncomfortable, something is very, very wrong. I don’t blame any of this on the recession. I blame it on a lack of energy, the absence of imagination, and the death of creativity and vitality that results from poor leadership and poor management. Your employees and partners blame it on you too, even if they are the ones doing a rotten job or uninspired and mediocre work. You’re not around or engaged enough as their leader, managing and leading enough to improve things. You are settling for less than is possible, no matter how horrible the economy might get ”“ attentive energy isn’t totally dependent on your bank account. There is always something to be improved and reinvigorated; there is always someone to be coached into achieving their full potential. Your customers blame it on you too. As is the local way, they will generally be very forgiving of your employees ”“ I was, and I’m a coach who has a very hard time keeping her mouth shut when I’ve got a living laboratory right before my eyes! Customers will blame anything hinting of monopoly behavior, an arrogant resting on laurels, or a recession cop-out attitude on you the owner, you the boss, you the manager. They will blame it on your poor leadership and management, and in my opinion, they’re right, for you’re better than that. If you are committing the sin of mediocrity, allowing energy to drain out of your company, your business will die. Your customers may not have a choice now, but the day they do, it will be all over for you. Please: Be Alaka‘i great. [From the archives: Can you define your Leadership Greatness?] Help your employees and every one of your business partners be great every single day, and with every single customer. Banish mediocrity by proactively choosing to lead and manage exceptionally well. It is not that difficult knowing how to begin: Look at your business the way a customer does. Start where you can visibly see you need an infusion of fresh energy. We will talk more about this in my next posting on Thursday. Turn your customers into raving fans who feel smugly smart for choosing you and giving you their money. When you do that, this negative, “oh woe is me” recessionary thinking will end for all of us. The raving fans you want talking about you (and writing about you) are those customers who feel savvy and in-the-know brilliant that they chose you: When someone recommends you to their family and their friends, the quality of their opinion is on the line, and they know it. I am not giving up on my goal. No way. If anything, I am more determined than ever to talk about Aloha-inspired Ho‘okipa customer service. Has mediocrity been banished from your business? If you think your workplace has service levels which will dazzle me, please write and let me know about you. And don’t waste your time telling me about your product features: Even a great product never reaches true excellence without a human service component attached to it. On the other hand, if you are Aloha and Ho‘okipa exceptional, our Say “Alaka‘i” readers deserve to know about you, and I want to help them choose you and give you the patronage which will help you thrive. I’m glad it bothers someone other than me. Ranting about this is not only appropriate but needed! “Mediocre” – powerful word. I looked it up and saw these disturbing words. After the list, look at the antonym. ordinary, average, middling, middle-of-the-road, uninspired, undistinguished, indifferent, unexceptional, unexciting, unremarkable, run-of-the-mill, pedestrian, prosaic, lackluster, forgettable, amateur, amateurish; informal OK, so-so, ‘comme ci, comme Ã§a’, plain-vanilla, fair-to-middling, no great shakes, not up to much, bush-league. No need to apologize about something like that, Rosa! It needs to be said, repeatedly and everywhere! That’s the insidious problem with prosperity: it can lead to bad habits of complacency and mediocrity. Then, when it comes time to need the customer-service skills that will keep customers raving about you, those habits are gone! Not a pretty picture, I’m afraid. Keep the chin up, Rosa – there’s on-the-ball folks out there just waitin’ for you to show up, I’ll bet! Goodness Dean, those words do help drive the point home! Thanks for sharing them. Interesting how “excellent” stands alone too. A good prepping to the follow-up I now have queued for Thursday! Thanks Robert. I get very conscious about being a complainer versus a cheerleader, and much prefer to be an evangelist, but this is not a problem we can afford to ignore either, and mediocrity – though jarring when you look at Dean’s list of words again – can be sneaky at first, for it creeps in as complacency and boredom, and then apathy. Once we get to mediocrity the manager really has his/her hands full. True about what you called “the insidious problem with prosperity” for success can be the worse thing that happens to a business, we see it play out time and time again. Hi Rosa, Mediocrity has been a serious problem in American enterprise for some time now, and it’s getting worse. At the moment I think we are in a mediocrity mindset, for which I blame two things – prevailing political sentiments and a massive failure of private enterprise to provide economic and moral leadership. Today the mood is, we need to cut the pie into fairer pieces. There isn’t enough to go around. We have to settle for less. I’ve seen this mood before in all its glory, in 1976 in the Soviet Union. Believe me, that’s not where we want to go. Keep ranting, Rosa! Rosa, I read this post and before turning outward I looked within asking myself the hard questions – have I allowed mediocrity in any part of my business or life? My answer, honestly is “yes” so thank you for this post. As for those businesses, sadly when people are not held to a higher standard they very often don’t rise there on their own. We need leaders who challenge us to be our best, in the workplace that means putting people in positions of strength and setting the bar high enough to challenge but low enough to knock it out of the park. I don’t see this as a rant but a well written, insightful, impassioned call to action. Brad, I chose the word “Sin” for my title because “serious problem” just isn’t getting our attention anymore… thought about calling it a crime… both are immoral and an assault on the business values that help us realize our full potential as the good people we are. Sticking with my own circle of influence for now, I agree that we in private enterprise need “to provide economic and moral leadership” – and not shy away from that concept of morality. It is time to stop being “politically correct” and wimpy. We need NOT settle for less. Karen, the way you instantly self-reflect first is such a strength (and it is a very consistent strength with you). Knowing you as I do I really doubt there is a shred of true mediocrity in your business, but we all have traces of the warning signs that can begin to take us there, and I appreciate your coaching added to mine here! “…the roomful of CEOs stood up one by one to agree: The value in their companies came from the employees who were motivated to be there. One passionate employee is worth 10 dispassionate ones. This seems simple, yet over the last six years I’ve realized that the question “What should I do with my life?” still triggers some major misunderstandings. So let me bust through a few of the major fallacies that people project onto this dilemma. Myth 1: People are the architects of their own change. He goes into 6 myths altogether, but this first one really hit me with illustrating this dire need we have for leadership right now: Most of us DO need to be pushed into change – all kinds of change, not just in regard to our careers – and we need brave leaders who will get us to be idealists again, and make us want to change (i.e. getting our self-motivation to kick in). We do need the tough love of pushing each other and supporting each other on the road to more greatness. Life is a full contact sport, and in business we need to play ball. It’s a horribly depressing thing to go to a place run and staffed by zombies. I have to say though, you had every opportunity to use your powers for evil and name the bad guys in this post and you didn’t. THAT is something I respect a great deal from you. If they’d been outstanding and wowed your socks off I’m 85% sure you’d have mentioned their name but in this case, when you could have said “Joe Bob’s Tire Emporium on 13th and Palm is teh suxors!” you didn’t and I find that very classy, and very cool. They didn’t work to earn the respect you showed them just there and they didn’t give it to you. And the fact that you did them the courtesy they didn’t do you is very cool. You’ve got class even when you’re upset. I think that’s very cool. Thank you Rich. If they were truly evil I might warn people to steer clear I guess, but only if I’d talked to the owner concerned and was sure he/she refused to change their ways and would continue the travesty adding true injury to insult. I prefer to believe that everything can get better and be improved, and I don’t want to be the one driving that first nail into their coffin.